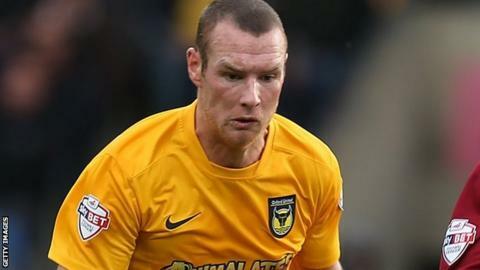 Oxford United striker James Constable says the squad are relishing the chase for the play-offs and can handle the pressure of trying to seal a place. The U's are seventh in League Two and occupy the final play off place. Oxford United's current goalscoring record of 107 has been held by Graham Atkinson since 1974. They host York, who are a point behind them, on Friday. "As a group of players we'd rather have the pressure of trying to get into the play-offs, than the flip side of fighting to stay in the league," Constable told BBC Radio Oxford. After Friday's game they will have three matches remaining and Constable says the squad are desperate to seal a play-off place. Constable, who has 106 goals for the club and is two shy of breaking Oxford United's record, says the hunger for success is shared throughout the squad. "Everybody wants success and to be in a winning side and come Friday the lads will be desperate to continue that run and have a bit more excitement in the final three games," he said. "We are desperate to get in there and hopefully put a bright end to the season." After York, Oxford play Scunthorpe, Accrington and Northampton, managed by former U's boss Chris Wilder. "As a group you would not want it any other way," he said. "You wouldn't want to be finishing mid-table with nothing to play for, so it's exciting that we are still in with a chance of making the play-offs and now it is up to us to go and perform." Meanwhile, Constable says he is even more determined to secure a place in the play-offs after accidently stumbling across BBC Radio Oxford's highlights of the Conference final in 2010. Constable says he found a lost memory stick with the podcast on it and hearing the highlights of that day four years ago has made him eager to create similar memories this season. "It brought back a lot of good memories and hopefully the lads that are here will be keen to re-enact that performance and the same outcome," he said.